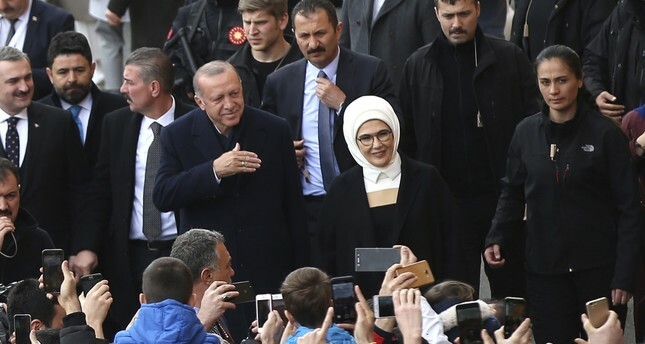 President Erdoğan and his wife first lady Emine Erdoğan wave to the people they arrive at a polling station in Istanbul, March 31, 2019. The Justice and Development Party (AK Party) received the 43.16 percent of the vote in the local elections of 2014, the highest of all participating parties. For the local elections of March 31, it received 45 percent, increasing 2 percent, and came out as the clear victor again. However, the country's major cities, such as Istanbul and Ankara, voted differently in the majority, which shows the power of the legitimate election rallies in Turkey. We should remind readers that this 45 percent follows the AK Party's successes in the past 14 consecutive elections, having come out on top in six parliamentary elections, four local elections and one presidential election. Sunday's local elections were no different, with voters having showed their support once again for the AK Party. Voter participation in the previous local elections was high, at 89 percent, and again recorded as 84 percent in yesterday's election. Compared with the 2019 local elections, the last local election in 2014 could be considered to have been one of the AK Party's politically critical thresholds, as they were the first elections held following the Gezi Park protests of 2013. They were also held under the shadow of the allegations of December 17 and December 25 perpetrated by members of the Gülenist Terror Group (FETÖ), who had infiltrated into the judiciary. At the time, opposition parties believed the AK Party would lose support and had great hope its then 12 years in sole power would come to an end. This success passed uninterrupted with clear victories in the 2014 presidential election and the 2015 parliamentary elections and the final parliamentary elections of 2018. The party has tested itself at the ballot box many times over the past five years and the majority of the electorate has given it a vote of confidence. As the ruling party, going into Sunday's local elections and having won 13 consecutive elections, it emerged victorious once again. In the time that has elapsed, however, the ruling party has transformed itself as well as the opposition. The process to follow will change the course of politics and for those who want to stay in the race. First of all, some of the issues that were not on the agenda for the 2014 local elections came up in the campaigns leading up to Sunday. For example, almost all parties made promises concerning street animals in metropolitan cities like Istanbul. The increased urbanization in recent years has found a matched increase in the spread of single-person households, the lifestyle of living single and pet ownership. As such, the topic emerged as a post-infrastructure problem for the country, due to uncontrolled pet ownership and a lack of criminal law for those who abandon their pets on the street. The cities are also full of street animals that are compatible with the urban environment, and found a place on the agendas of municipal administrations, which gave promises concerning their reproduction and care. Another issue that seriously came to the agenda went beyond the classic promises concerning women, such as those about preschool. Almost all parties promised access to preschool for both working and non-working women with young children. At the least, a mother being able to leave her child in the care of credible professionals is an important societal issue. That topics such as preschool and animal rights having come up as topics of discussion in these local elections is an indicator of the country having reached a level above its previous municipal and infrastructural problems. Promises about garbage collection in cities or uninterrupted water service are no longer necessary. The opposition parties' rhetoric resembled each other on one topic – that of the country's Syrian refugees. Even though this was a local election, the 3.6 million Syrian refugees in the country were again a point of discussion, as they are in every election, particularly for the Republican People's Party (CHP). Turkey's deepening economic crisis in recent months has also actively increased anti-Syrian and anti-foreigner sentiment, and will continue to do so. An example of this is the banners hung by a candidate for the Good Party (İP) in the Fatih district of Istanbul that said the district "would not be left in the hands of Syrians. "Despite the reactions the banners attracted, no correction came from the İP; the party's candidate tweeted, saying she wouldn't hand Fatih over and asking if voters would. Despite the rising anti-migrant trend in the West, looking at the last night's results for the İP, it would be fair to say that anti-Syrian rhetoric is still not a working formula for Turkish voters. Complaints by citizens about refugees living in huge numbers in big cities do not have a reflection at the ballot box and this means voters still approach the issue more as a humanitarian issue than as a security concern or threat. Other than discussions of urban development and municipalities, another thing that changed the course of the campaigns was that of identity. The two political strains in Turkey are represented in political coalitions and the polarization in the country shows itself in referendums and local elections quite clearly. In other words, the rhetoric and arguments put forth in campaigns for parliamentary elections have now become a part of local elections as well. With this as the new reality, the classic debate of secular versus anti-secular and the occasional headscarf debate have entered the agenda and played a role to consolidate conservative voters, as one topic of this theme has been videos of women wearing headscarves being assaulted on social media. Even so, none of these videos received a notable response from the opposition parties, yet the CHP tried to woo religious conservative voters. The CHP mayoral candidate for Istanbul, Ekrem İmamoğlu, won great recognition for reciting the Quran openly in a mosque in Istanbul. Despite all the identity crises, leaders and major politicians did not say a word of hate, and embracing everybody was the main theme of the campaigns. Perhaps the AK Party's greatest achievement after its 17 years of uninterrupted power, is that it has transformed the opposition while taking shape according to the general trends in society.